The Artworks blog is delighted to hear that Kit Price Moss has had one of her watercolours selected for the Society of Wildlife Artists Annual Exhibition 2013 at the Mall Galleries, 31st October-10th November 2013. 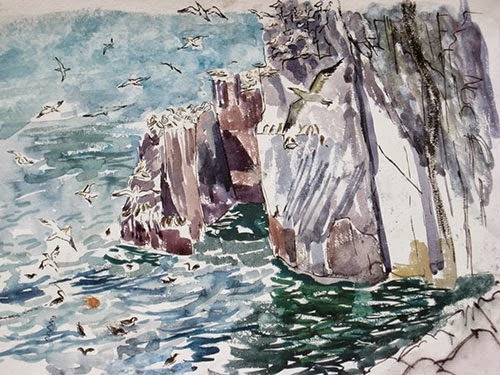 Kit’s watercolour study, ‘Bass Rock: Cliff Activity‘, was painted on site at Bass Rock in the Firth of Forth, near North Bewick, Scotland. We wish Kit Price Moss every success with the exhibition. The annual exhibition of the Society of Wildlife Artists takes place at the Mall Galleries in London, from Thursday 31 October to Sunday 10 November 2013. The annual exhibition of the Society of Wildlife Artists is a showcase for the very best of art inspired by the natural world. A superb mix of painting and drawing, sculpture and printmaking will be complemented by a display area of projects and expedition work. This entry was posted in artworks news and tagged exhibition, kit price moss, london, watercolours on October 24, 2013 by admin.